One of the first things we do when we start working with a new digital marketing client (sometimes even before the actual engagement begins) is ask about their website metrics: How are they doing? Is their website effective at driving leads/sales? Do they know which pages on the site are the best at converting visitors into customers — or even which pages are most likely to keep visitors engaged with their brand? 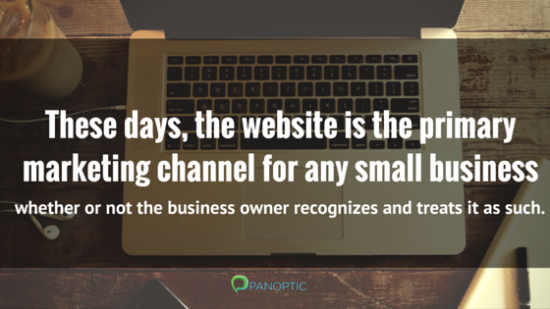 More often than not (perhaps with the exception of e-commerce businesses) small and medium business owners have no idea how their websites are performing. That’s understandable – SMBs have so many things to worry about they may not be thinking about their website at all. A business website was just something they knew they needed (because every business needs a website) so they got one. If any additional leads or sales came their way as a result of having a website, that was a bonus. These days, the website is the primary marketing channel for any small business whether or not the business owner recognizes and treats it as such. Small business owners should take a look at their website stats once in a while to get a sense of whether and how the site could be working harder to bring in qualified leads and customers. We do a lot of coaching for our clients around using Google Analytics, and in almost every case our clients are initially intimidated by the interface. Truly, Google Analytics presents a TON of data (and views and filters and buttons and widgets) that can seem overwhelming to the newbie. But like anything else, it’s much simpler once you know what you’re doing. With that in mind, we’ll be introducing you to some of the essential and easier-to-understand reports available to you and explain how to interpret the data. Once you start to feel comfortable with these basics and begin to value the insights the Google Analytics tool can provide we think you’ll be encouraged to explore more. Did they perform a search? Did they see something on Yelp or Facebook or Twitter that led them to the site? Did they get an email and follow a link? And once the potential customer actually arrived on your website, what did they do? Did they read the page they landed on and then leave? Or did they make a purchase, book an appointment, download a brochure or fill in a contact form to request more information? The Source/Medium report can be found by navigating to the Acquisition section of Google Analytics. It shows you how acquired visitors — that is, how website visitors got there in the first place — and gives you an idea of how engaged they were with the site once they got there. In the Source/Medium report traffic is broken down by Medium (e.g., organic search results, link from a referring website, email, social media channels, etc.) and Source (Google, Bing, Yahoo, Facebook, Twitter, etc.). In our example, the Sessions column indicates that 36% of the site traffic arrived at the site via a Google search. Bounce Rate – The Bounce Rate is a measure of single-page views, that is – the visitor landed on a page on your website and didn’t click on any links on the page or take any other action. In our screenshot we see that almost 59% of the traffic that arrives to this website from Google organic search “bounces” – visitors either click away to another website or timeout after 30 minutes of inactivity. Pages/Session – The average number of pages that a visitor looks at each time they visit. 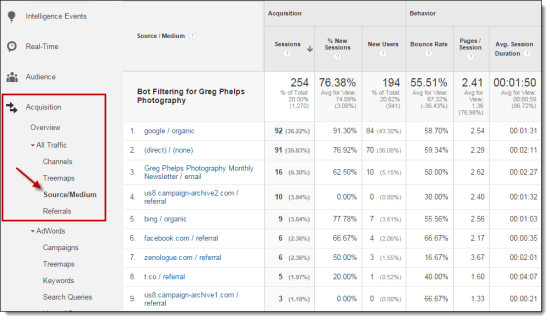 Our example shows that visitors arriving to the website from zenologue.com are the most engaged, viewing an average of 3.67 pages per session. Avg. Session Duration – While traffic referred from Zenologue may have the lowest Bounce Rate and highest Pages per Session, visitors who followed a link from Twitter spent the longest amount of time on the site. Clearly the client’s Twitter following likes what they see, which might be a reason to Tweet more. As a business owner or marketer, you should want to know these things. They can help you replicate what’s already working to bring in business and give you insights into where improvements could be made. Google Analytics makes all the information available to you – you just need to take advantage.